Fingerplays for preschoolers are absolutely magical! 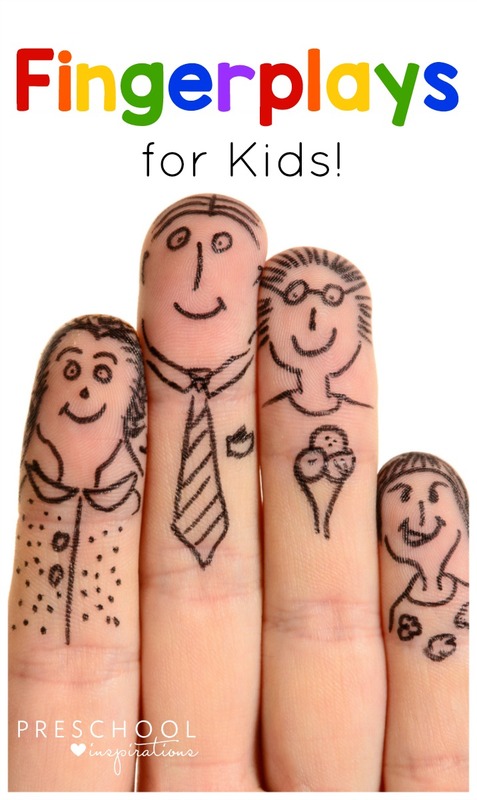 There is so much value in fingerplays, and I love using them at the libraries where I do Story Time. These teachable moments help children with fine motor development, pre-writing skills, language development, and so much more! Fingerplays are perfect for circle time, large group learning, small group learning, in musical settings, one-on-one, and even for independent play. Used to increase creativity, body awareness, etc. Not only are children learning tons from them, but they are entertaining too. As a parent, I use fingerplays on a regular basis in fun and meaningful interactions with my little ones. They have saved us from looming meltdowns and worked magic in waiting rooms and restaurants too. In the classroom, fingerplays are a great way to start circle time and to transition to a listening activity. 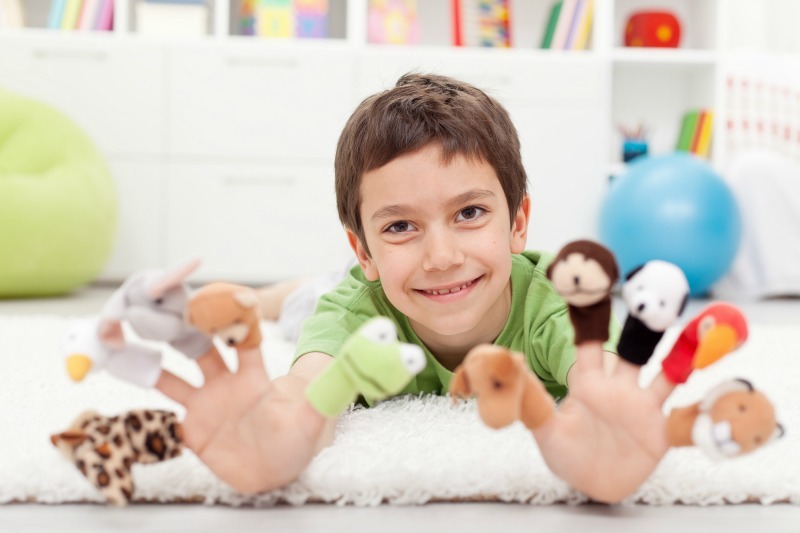 We especially love adding finger puppets to our fingerplays! After using fingerplays for years, I have put together the fingerplay songs that are our most favorite. Get those fingers wiggling! The ladies of Jbrary are a fabulous resource for all kinds of fun interactive rhymes and fingerplays. Five Little Hot Dogs is a favorite STEM & counting fingerplay. Follow along and count down the hot dogs as they heat up and “pop” while cooking in the pan. Another favorite would be Bubble, Bubble, Pop. Children learn counting, colors, and all about ocean life. Bubble, Bubble, Pop is a magnificent pairing for books such as Dr. Seuss’ One Fish, Two Fish, Red Fish, Blue Fish or Deborah Diesen’s The Pout Pout Fish. Alina Celeste is an incredibly dynamic children’s musician, and her interpretation of some of the classic fingerplays are absolutely delightful! Two Little Friends is funny and engaging. It’s also probably one of my top 5 fingerplays and a frequent request of my own kiddos. This song is a great tool for building background knowledge on opposites and vocabulary skills. Alina Celeste’s charming interpretation of Here is the Beehive has also been a hit with little learners both in the library, classroom and at home! This one can be incorporated into a lesson/theme on bees or counting. Children’s musician Nancy Kopman is extremely popular in our household! I will often find my children singing and acting out the hand motions of her songs unguided. This particular song has also been popular with caregivers in baby lap sit programs. You cannot have a list of fingerplays without including Open Shut Them! My children are in love with the version sung by Debbie Doo. This is one that I have also used frequently in the library. It allows babies and children the opportunity to match finger movements to lyrics. It is also a perfect transition fingerplay in the classroom. Once you have heard Finger Family it is incredibly difficult to get it out of your head! In fact, this particular song became part of our bedtime ritual for months. Not only are you matching the finger motions to the lyrics, but you are also working on background knowledge about family relationships. This song is perfect for planning social/emotional learning. A fantastic fingerplay for building strength and coordination is the pincer grasp promoting Fe Fi Fo Fum. There are many versions of the popular fingerplay story and song Baby Shark. I am especially fond of the version sung by Miss Nina. This is a great song that provides narrative skill building, fine motor skills, and background knowledge. Last but not least is the amazing Dr. Jean with some quick and fun fingerplays that children find irresistible! Some include Five Little Monkeys and the Alligator, Little Turtle, and more! We especially love Dr. Jean’s explanation of the benefits at the very end. Here are a few more ideas about finger play songs and rhymes. Do you have any favorites you’d like to share? Need more songs to use all throughout the day? We’ve got you covered! This was extremely helpful from one Arizona girl to another!